Nancy L. B. Michlin, M.Ed., C.H.C. is the co-owner, CEO, and Health Coach for Back To Health Family Chiropractic. 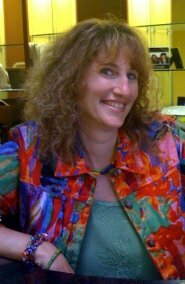 Nancy is a proficient Instructional System Designer with nine years of experience designing and developing training for the F-35 Lightning II Pilot Training System and Bachelor of Science manufacturing engineering courses for Wayne State University, Lehigh University, and University of Detroit Mercy. She is especially skilled at project management and coordination, problem solving, objective development, designing formative evaluation tools, and implementation. Nancy has excellent analytical and communication skills. Nancy strives to make your experience at Back To Health Family Chiropractic positive in every possible way. She is warm and friendly. She knows that your health care includes a relaxing and optimistic environment. From the moment you enter to the moment you leave, The Back To Health Team focuses on you. Nancy has had her own health issue to overcome. She thought that she lived a healthy lifestyle until she got diagnosed with breast cancer (and later hashimoto's disease and osteoporosis). After her diagnosis, she scoured all the information she could find on the pillars of whole body health and wellness. She transformed her entire way of life. In the process, she has become a healthier, happier, and stronger person. She also has more empathy for what their patients face. Through her experience, Nancy is devoted to empowering others to take charge of their own health! She has taken classes on health and wellness and earned a Health Coach Certification. Many families today are overwhelmed with packaged and processed foods which can have a negative impact on their health. Educating individuals and families on the best ways to consume rich nutritious food and how to live a healthy lifestyle is a passion of Dr. Chris and Nancy Michlin. That's why the Michlins have taken the time to obtain Health Coach Certifications through Dr. Sears’ L.E.A.N. (Lifestyle, Exercise, Attitude, Nutrition) classes. The courses are a three part series: Dr. Sears’ L.E.A.N. Start/Dr. Sears’ L.E.A.N. Essentials (focusing on healthy lifestyle choices for families and children ages 6 - 12), Dr. Sears’ L.E.A.N. Expectations (teaching the needs of pregnant women, fetuses, and infants), and Dr. Sear's Prime-Time Health (examining what we can do to avoid pre-mature aging and body breakdown). These courses provided valuable information on how to make healthy nutrition and lifestyle choices while on a budget and pressed for time. The courses are about living a healthy lifestyle, not just starting another diet. The Michlins have added a sister company to their clinic, which focuses on four pillars of health and wellness. Nancy is coaching people on ways to empower themselves to make healthy life choices. Click here to learn more about staying healthy! Nancy’s story was aired on CBS 11 news and posted on The Next Chapter Medical City Dallas and the Susan G. Komen Fort Worth websites. Watch her minute news segment below. Below is the video is on the Komen Greater Fort Worth Channel. In the following video, Nancy shares more of her story. It gives critical details that were edited out of the others. Please set aside nine minutes to learn more about Nancy's journey, and her thoughts on staying cancer-free for life! 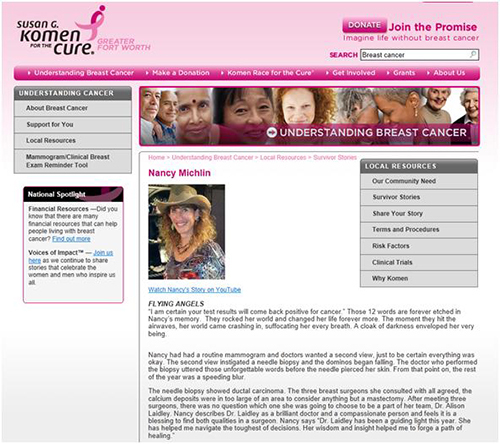 You can also read Nancy's urvivor rofile on the Susan Komen Greater Fort Worth site as well. Click on photo to redirect to the Komen site. 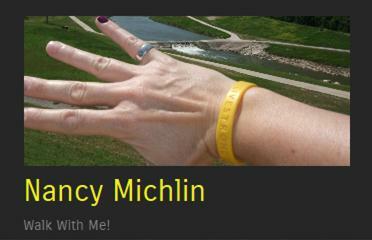 If you would like to keep abreast of Nancy's happenings, you can follow her blog. Click on the photo to redirect to her site.